We have been talking about planting grapes in our yard for a long time but weren’t ready to take the leap until recently. This was a first for both of us, so we had some research to do, and the Virginia Tech Cooperative Extension had the just the information we needed. As with all plants, the first thing to do is determine placement. Grapes need full sun with primarily southern exposure, so we decided on a spot along the fence that gets full sun and mostly southern exposure. We also had to amend the soil somewhat, as we have loads of clay in the ground and grapes need sandy loam or at least adequate fertilization and drainage, but we figured we have a pretty good chance of success since the wild grapes growing out in the weedy area beyond the fence are going gangbusters. Michael dug the holes about 2 to 3 times as deep and wide as the pot the vine came in and added peat moss and a few pine nuggets because grape vines prefer acid soil. Right now they are surrounded by grass, but we plan to remove that and mulch the area because grape vines don’t like competition from grass and weeds. 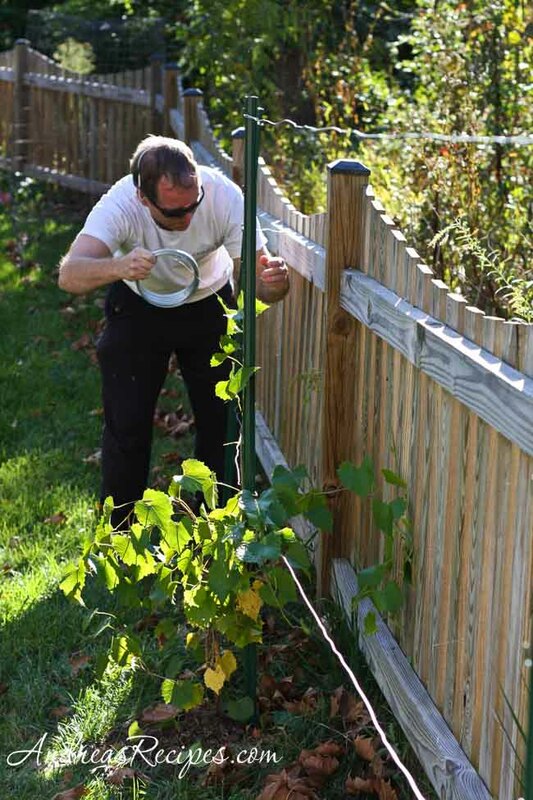 To provide support for the vines as they grow, Michael built a trellis using u posts and 14 gauge wire, both of which you can find at a home improvement store. 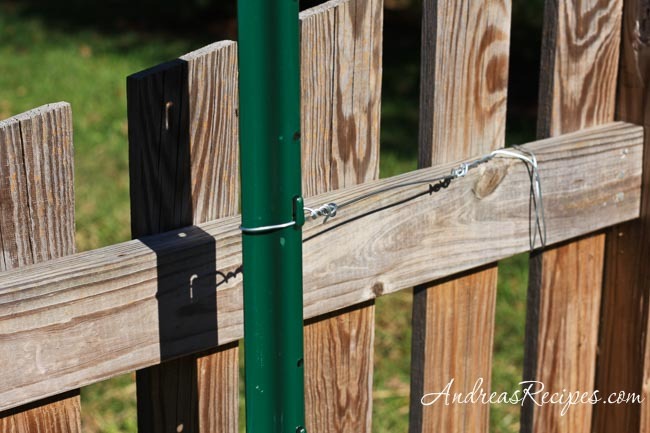 He used the wire to tie the posts to the fence for extra support, then strung the wire between the posts. As the vines grow we will train the trunk to grow up the post and stretch the arms along the support wires, and we will learn how to properly prune grape vines, a task that should be done annually. Grape vines need time to develop a good root system, so the first two years in the ground should not focus on fruit production. Pick off the fruits and don’t allow them to ripen so all the plant energy can go into maturing the vine. If the vines do well, we should get up to 15 pounds of Muscadine grapes per vine every year once they reach maturity, and then we’ll be very busy making jam and juice. 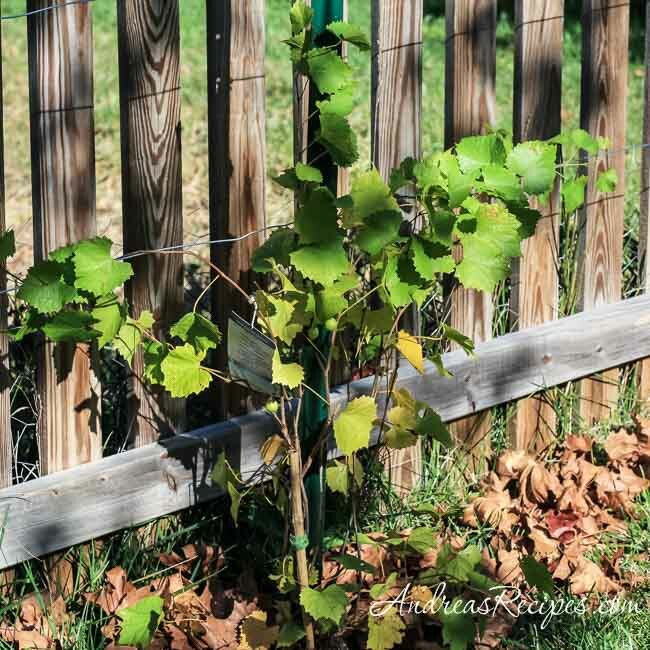 If you want to try growing grapes in your yard, make sure you check out your state cooperative extension website for information on varieties that grow best in your area. Did you use 3 u posts — how many wires did you string across? It looks like the vine is training up a post and then going out to 2 more — can you tell me the distance between posts? I am not very creative and need to follow some good instructions 🙂 I too plan to utilize space beside a picket fence so I don’t have something else to mow around 🙂 Thanks for your help. Hi Gina. We strung two wire across the middle and near the top third of the posts, and the posts are about 2-3 feet apart. Good luck with your grapes!